In the last episode we introduced the “Sexi Brexi” 5-2-3/3-4-3 tactics. The post was dedicated to the tactic I’ve been using with Stockport, I look deep into the tactic to explain how we try to play and how it works. To read more about our Sexi Brexi tactic, follow the link in the image below. The victory party was coming to an end, but loads of players, staff and supporters still remained dancing, drinking and singing “We are the Champions”. Rolf Elgeti, The Stockport owner, slowly approached manager Marcus Allbäck. [Read like Arnold Schwarzenegger] “We’ve done it, Marcus! We’ve taken our first small step” he yelled over the loud music. “I know this is a night for celebration, but I want to discuss something with you”. The two withdrew to a neighbouring room where they could speak. Marcus Allbäck felt a bit dizzy after drinking pint after pint all night but he could hear Mr Elgeti loud and clear. “What you have done is nothing short of amazing. You won the league in our first season, and to be honest you won it with a squad full of crap”. Marcus Allbäck couldn’t believe his ears. He was so proud of the group of players that had struggled and fought together all season long and had been rewarded with the best reward ever, the title. He wanted to defend the guys, but in a way he understood what Mr Elgeti meant. During the season the lack of quality had been frustrating at times, but no-one could take away from the players what they had achieved. He was just about to start protesting as Rolf Elgeti spoke again. “Therefore I want to give you some money for next season. How does a million Euros sound to you?”. Mr Elgeti chuckled a bit as he saw the half drunk/half astonished look on Marcus Allbäck’s face. Even though it certainly hadn’t appeared that way Marcus was now certain that Mr Elgeti was blind drunk. Money? From this man!? He was absolutely gobsmacked. “But. There is a certain but” Mr Elgeti continued. Here we go again, thought Marcus. I’m only allowed to sign Sulawesi players or players with more than seven syllables in their surnames or some other ridiculous stuff. The half astonished look on his face must have been replaced by something much worse as Rolf Elgeti asked “Marcus, are you sick? Are you gonna throw up? Do you want to lie down?” Marcus Allbäck shook his head and tried to look as neutral as possible while his thought spun around in his head. How was he gonna get his hands on that money? “Marcus, I need to ask you something. What are the two things all German people think of when they think of England?” Marcus Allbäck started thinking. Bangers and Mash? Gary Lineker? The Queen? He honestly had no idea. Finally he took a wild guess and said “John Cleese and Geoff Hurst?” Rolf Elgeti started laughing hard. “Oh, Marcus, you must be so drunk. I’ve never heard those names and I’m not even sure that they are real! No no no, when German people think of England, they think of kidney pie and Jack the Ripper”. Marcus looked really puzzled so Rolf Elgeti tried explaining. “You know, butchers and killers!?”. Marcus Allbäck was quite certain that that was not at all what German people thought of but he didn’t want to risk the money he had been offered and he really wanted to find out where this was going, so he kept his mouth shut once again. “Just like with our Sexi Brexi style of play we want to honour the Englishmen by paying tribute to these fine professionals. I’ll give you one million Euros IF you build me a team of butchers and killers”. Before we’ll get into the “Butchers and Killers” concept, let’s look at the results of the second half of the 2018/19 season. As you might have already figured out, Stockport won the Vanarama National League North, but we came very close to a true bottle job. The five-point lead the team had going into the second half of the season was down to a single point in early March after back-to-back losses. After four straight draws that saw the Stockport players miss obvious sitters and basically concede goals for shits and giggles in March and April meant we were all of a sudden in third place. However, there was only two points between top of the league York and Stockport since all the other top teams did everything in their power to avoid winning as well. In the final two games the Stockport players pulled together and managed to produce two of the most emphatic wins throughout the entire season. 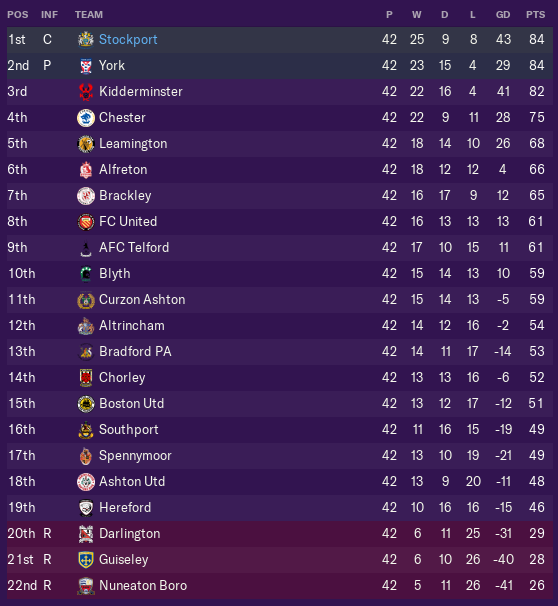 This was just enough to top the league ahead of York on goal difference and gain that sweet automatic promotion to the Vanarama National League, the 5th tier of English football! We had decent cup runs, but couldn’t really match the success of the league play. We managed to make it to the FA Cup proper and pushed League One side Rochdale to a draw at home. In the replay we never stood a chance, however. 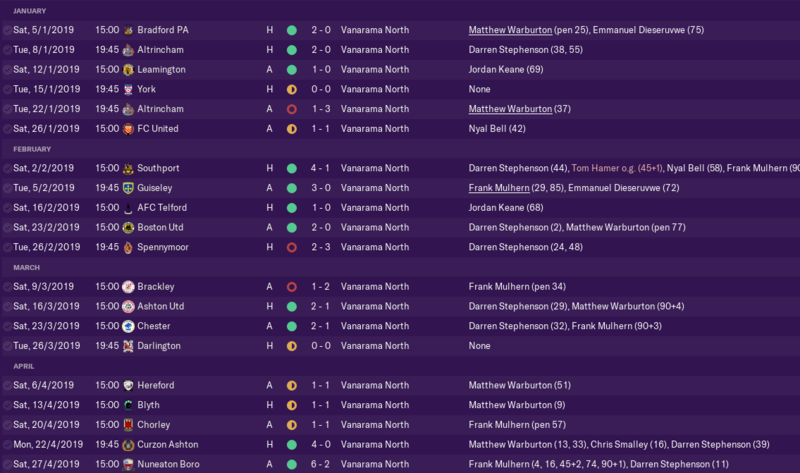 In the FA Trophy we punched above our weight class for a while and knocked out Vanarama National League sides Ebbsfleet and Wrexham, before losing in disappointing fashion to Billericay, who actually went on to win the Vanarama South this season. Just like in the first half of the season, Darren Stephenson was our greatest player. He ended the season with a fantastic record of 26 goals, 15 assists and 27 chances created in 37 starts for us. 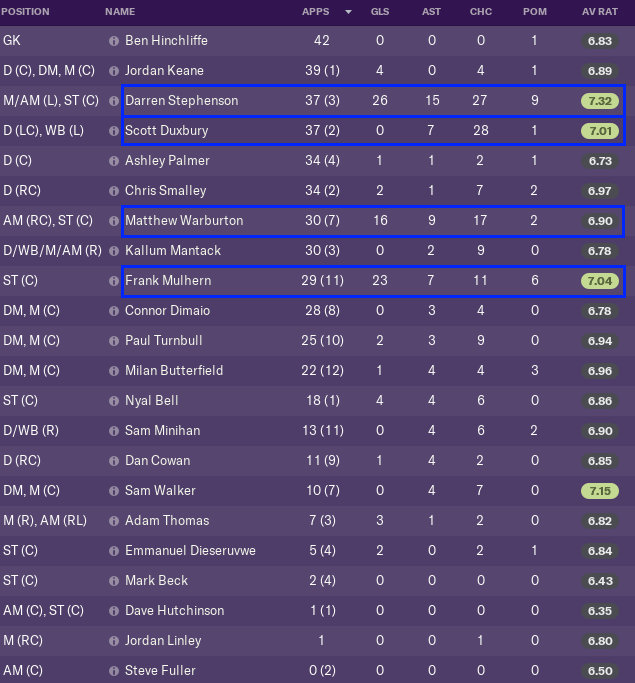 Fellow strikers Warburton and Mulhern also contributed massively in our offence. The final player worth mentioning is Scott Duxbury, our left wing back/quarter back who produced a staggering 28 chances created! Deservedly, Darren Stephenson won the Fans’ Player of the Season Award by an outstanding margin as well as the Vanarama National League North top scorer and Player of the Season. This youth intake was an utter disappointment without a single promising player. A 3-4 star potential on this level just won’t cut the mustard. 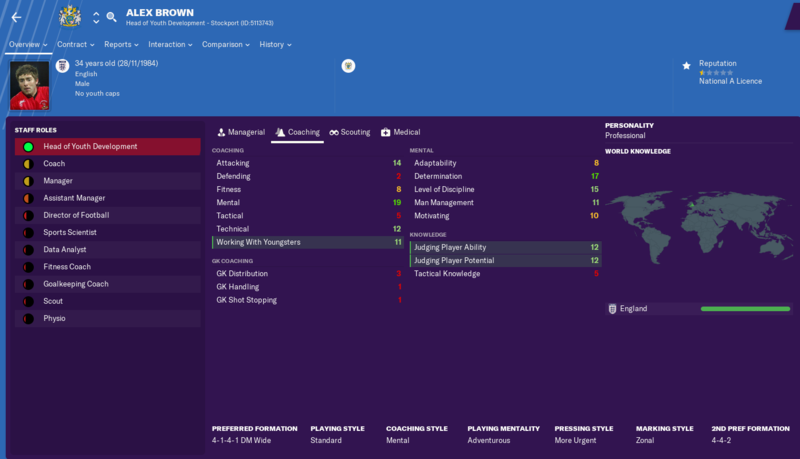 HOYD Alan Lord was immediately replaced by up and coming Alex Brown, who will hopefully use his Professional personality to bring better players to the Academy. To make sure that we’ll never have such a disappointing intake again the board also committed to raise our Academy Category from 4 to 3. So, the promised million became €844K, but that’s still a lot of money compared to last season’s transfer budget of zero. To be able to successfully climb the English League system with the Sexi Brexi tactics Stockport will certainly need players to fit that system. They will need “Butchers and Killers” as Mr Elgeti so delicately put it. What do we mean by that then? Well, butchers are sturdy and rock hard and like to crash and smash stuff. The killers, or assassins if you wish, are a bit more precise and distinct in their trade. Let’s not focus on the differences at first though. Let’s focus on the common denominators. All players in a “Sexi Brexi” Stockport team will need the skills listed above. All of these are skills needed for each and every player in a system that’s basically all about minimizing risk, working hard to win the ball back and then attack in a direct and swift manner. There are players that are simply only Butchers, in it to defend, crash and smash, win the ball back and give it to someone else. Then there are players that are pretty much only killers, in it to finish off the attack. Then there are players who are a bit of both. The wing backs, the BBM and the TM must all be able defenders as well as contribute to our attacking play. With our style of play we basically invite the opposition to cross the ball into our penalty box, where we are supposed to have plenty of mean to send it away. It has become apparent over the season that they are not good enough at doing exactly that, which is troubling. Since they fall back as soon as we lose the ball I haven’t really found that they need that much pace, since we’ve nearly never been threatened by balls in behind our back three. That might however change as we rise through the divisions and face better passers and strikers. Physicals: Acceleration, Pace and Jumping Reach. The combined skill set above basically describes Harry Kane or any other super striker, which is highly unlikely that we’ll get our hands on for many years to come. This means that we’ll either need to scale down our expectations to find players that are decent at the most but well-rounded or split the skills in a Big man-Small man fashion with one big guy with good heading and a quicker smaller guy. I really don’t prefer the latter as I want both players to be serious threats both on transitions and in the box. 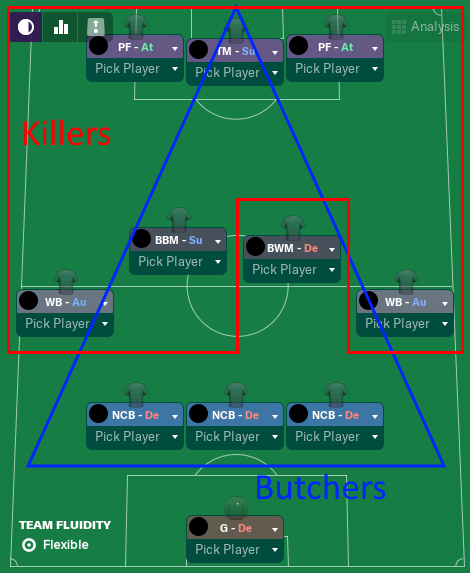 As mentioned above there are some players that are not pure Butchers or Killers, but a bit of both. As I mentioned in a previous post I’m one of the guys participating in NewgenFM’s Achievement Hunter Challenge. As we won the Vanarama National League North I’m proud to announce that we have our first achievement in the bag! That’s all for this episode. In the next one we’ll analyze the squad and go shopping for pieces for our “Butchers and Killers” puzzle. We’ll also look at the first half of the 2019/20 season. 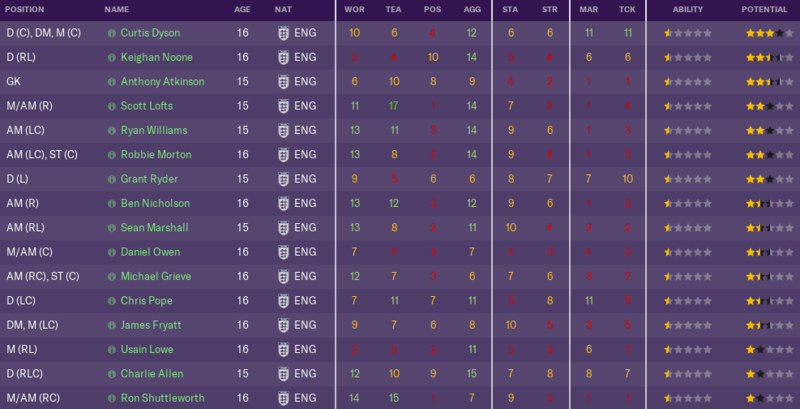 This entry was posted in Achievement Hunter Challenge | @MikaelinhoFM, FM19 Stories, Football Manager 2019 and tagged england, fm stories, fm19, football manager, Football Manager 2019, sexi brexi, stockport. Bookmark the permalink.